With the current dry spell looking likely to continue for further days or weeks, grass growth will come to a halt on more farms than are currently affected. Presently soil moisture deficits (SMD) range from some 90mm in the south east to some 60mm in the north west. Once SMD is over 50mm, grass growth becomes restricted, and at more than 75mm, drought conditions are occurring and perennial ryegrass will go dormant. Large quantities of rainfall will be required to fill these soil moisture deficits in the soil, with 25mm being equivalent to an inch of rain. Fertiliser and slurry applications will show no apparent benefit for grass growth until it rains and adequate soil moisture returns. However, much of the fertiliser applied in the last four to six weeks will remain in the soil. These will be re-activated once adequate rainfall occurs and growth conditions improve. It is best to hold off on any further N fertiliser applications until temperatures decrease (such as with dew at night) or prior to when rain is forecast on fields that were not fertilised in the last month. On fields that received a N fertiliser application after the last grazing rounds (such as where residual N is present in the soil) hold off on further N, fertiliser applications until after it rains, as the residual N in the soil will likely be sufficient to kick off grass growth. 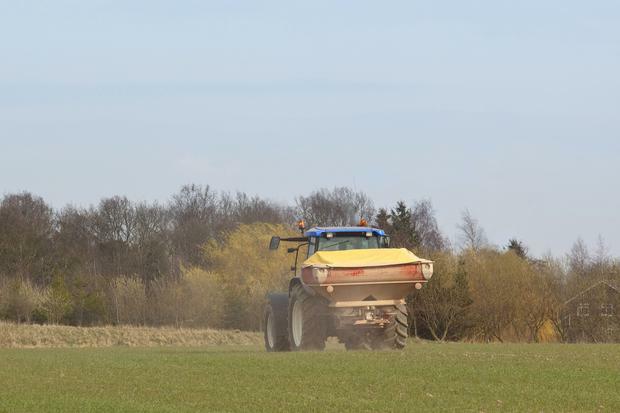 In drier soil conditions, fertiliser containing Ammonium Nitrate and Calcium Ammonium Nitrate as their N source are safer to spread and have lower risk of volatilisation loss to the atmosphere. Some dairy farmers are earning thousands of euros less than others, based on the base milk price paid by the main eight processors. However, they are not likely to become active or be taken up by plant roots until sufficient moisture is present. Applying slurry in hot sunny weather on very dry soil conditions will result in high N loss through volatilisation, and is not recommended. In addition, slurry spread with splash-plate will coat the remaining green leaf area on grass with slurry and cause this grass to burn under the current sunny and dry conditions. In recent weeks many grassland farmers has been forced to graze land that was closed for second cut of silage in June. This land is likely to have received either slurry or N fertiliser, or compound fertiliser at closing for this silage crop. In fields with lighter grass covers, a large proportion of this N-P-K applied at closing time will still remain in the soil. Where this ground will be closed again for silage in August or early September, aim to apply up to 40 to 50 per cent of the N required by the silage crop so that N remaining in the soil will be utilised before harvest in late September or early October. To alleviate fodder shortages on farms, prioritise application of fertiliser to fields that received no fertiliser for the last month to ensure that adequate nutrients are available once rainfall is forecast and growth commences. Stressed plants will respond better to the application of compound fertilisers with a high P and K concentration and sulphur. This is because the grass roots require less energy to find these nutrients. Remember, also, that the last date to apply N and P fertilisers is September 14. Therefore, fertiliser plans need to be adjusted now for the remainder of the season. Kevin O’Sullivan is a Teagasc advisor.